"Bookmark Direct - Image Recycled Paper Bright White, Free Next-Day Delivery"
A superior quality, high-white, multi-functional, uncoated paper, made from 100% reclaimed fibres. It delivers first class results with colour images and graphics and can be used with laser, inkjet, and sheet-fed offset printers. 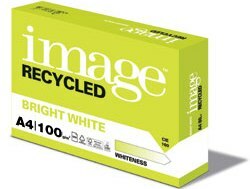 High White Image Recycled is ideal for letterheads, correspondence and presentation documents. It has good tractability (which means less printer jams) and an excellent opacity that makes it suitable for double-sided printing and copying.